Many thanks for your interest in our city and my work! I am a local guide of Dresden and I am running an incoming agency basing on my experience at a large international business travel company. Hereby we would like to offer you a short outline of possible guided tours through the city of Dresden as well as an excursion to the medieval city of Meißen and the summer residence in Pillnitz. We should like to mention that we are able to care for any means of transportation for your groups should they fly into Dresden. 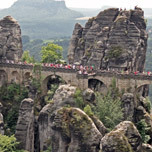 We will also be happy to assist you organizing your trip and to care about your stay in Saxony. It will be a pleasure for us to help you making the stay of your guests in Saxony as pleasant as possible. 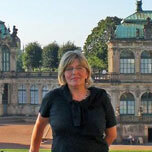 Please Note LatLon: Heidi Paizs is a city guide who works independently from LatLon-Europe. Please contact her directly to book your guided tour of Dresden. We wish you a great vacation! You have very little time, but you want to see the Dresden highlights? 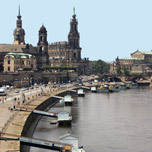 Get to know the city of Dresden during a sightseeing stroll through the historic part of the city! Your professional English speaking city guide will make you familiar with the most impressive sights. Walk from the world famous Zwinger Palace along the Semper Opera House passing by the Cathedral and the Dresden Residential Palace. Your guide will give the historic background. 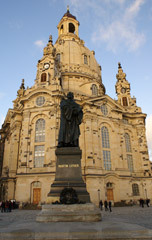 We show you the proud of our city, the reconstructed Frauenkirche, a symbol of reconciliation and peace in the world. 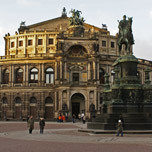 This a very special tour to get to know more in detail the city of Dresden. 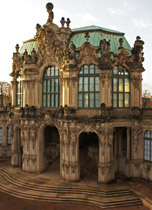 During the sightseeing tour by coach you will experience the history of Dresden between framework wine farmer houses and villas of Art Nouveau. 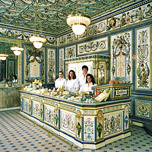 You will see the hilly part of Dresden with its famous suspension bridge and visit the unique dairy entirely equipped with tiles made by Villeroy & Boch (Foto ©: Pfund). At the end of this tour we will make you familiar with the Old and the New Town of Dresden and guide you along the most important sights of the historic city centre, i.e. the Zwinger Palace, the Residential Palace and the reconstructed Frauenkirche. Enjoying the panorama of the city of Dresden from the “Bruehl Terrace” we will finish the tour. Frederick Augustus the Strong was in love with the Asian style and you will note it. During a half day trip we would like to take you to the outskirts of Dresden , where you will find the charming palace situated on the banks of the river Elbe. The park is enchanting and your professional guide will take you on a stroll. We make use of the most typical means of transportation back to Dresden – by a paddle steam boat. On the boat you should not miss the Dresden speciality - cheese cake accompanied by a glass of Meißen wine!